Liz's Paper Loft: Thinking of You Card! Happy Wednesday Paper Lovers! I can't believe this week is half over, but that's a good thing since I will have a three day weekend! Do you have anything fun planned for the holiday weekend? I'm not sure yet, but I'm still looking forward to it!!! After four attempts it's finally uploaded! love it Liz...that burlap adds wonderful texture! This card is so sweet! Love the patterns and the burlap!!! Liz ~ Okay the card is just BEAUTIFUL! 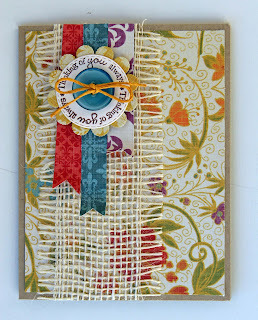 Of course I LOVE the paers , the burlap and the hemp! I LOVED you talked about your new puppy too ~ she sounds precious! I TOTALLY agree with the Cricut ~ I could just use dies and AWESOME embellies ~ like the stuff in your boutique ~ I would be in heaven! Great video! Great card! I love the paper, hemp and burlap! 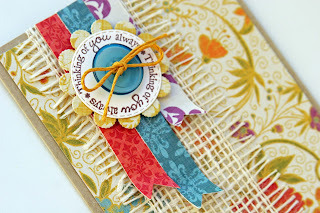 So fun to use different textures:) Can't wait to get the stuff I ordered:) Thanks Liz-great video too!